Pope attributes his softening to age. 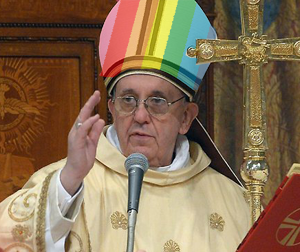 Pope Francis has revealed a softening on the Vatican’s homosexual position, insisting ‘you shouldn’t knock it until you’ve at least given it a try’. Reflecting changing views in society and a new, more fluffy form of catholicism, the 266th Pope admitted he was partial to the odd ‘pink pound’.